"Robert and I have worked together on a number of residential, commercial and retail projects over the past 15 years. He is a very good communicator and a talented designer. He can effectively manage complex problems with a calm and pleasant demeanor. I am impressed with Rob's ability to skillfully oversee the input from multiple consultants, to facilitate collaboration and to lead the design and building process to a successful end." "Working with Robert is always a pleasure. His communication and care of his clients is clearly evident in his working relationships. My clients were incredibly happy with his work, and I thoroughly enjoyed our partnership on the projects we shared. Robert has a deep knowledge and love of historical buildings and preservation. He strives to keep his designs beautiful and integral to the process, while balancing all the functional, code and compliance issues that come along with any project. You will be happy you hired him!" "Robert and I have collaborated on numerous projects over the last twelve years. His process is thoughtful, his insights illuminating and design work is impeccable. From my perspective, Robert brings three key attributes to his work, Environmental Responsibility, Cultural and Physical Compatibility and a tempered humility that promotes easy integration of client programing, place and the greater surroundings." "Rob was the architect for the restoration of a historic commercial building in Ashland, Oregon while I provided historic preservation services to secure State and Federal tax credits important to the project funding. Rob understood the need to maintain the project's historic character, while balancing the needs for a functional, efficient, operation. This project was a success on all levels, while the restoration was honored with local design awards. I'd certainly recommend Rob for similar projects in the future." "Robert did an outstanding job in all aspects of designing and rendering a modern house that my wife and myself just loved. He also was wonderful in his mediating between my wife and myself in getting agreement on what we really needed in a custom designed home. He is recommended highly!" "Robert Saladoff designed my home in Ashland, Oregon, and did an excellent job. 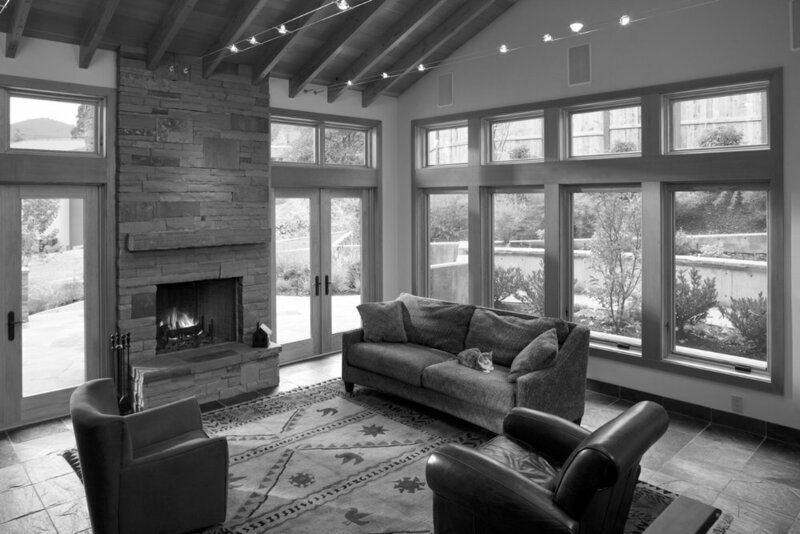 Although my home was new construction in a historic neighborhood, Rob designed a home that fit beautifully into its surroundings, and won an award from the City of Ashland's Historic Preservation Commission. He has an eye for details, and also is environmentally conscious. Rob was easy to work with, professional and conscientious. I highly recommend him." "Rob Saladoff helped us realize our dream of transforming our 1976 split level ranch style 1600 square foot home into a 2700 square foot, modern Craftsman style home. Rob's design has the attention to detail needed to create the illusion of new construction both inside and out. We are most appreciative of how Rob integrated our ideas and communicated clearly to us and our contractor, resulting in a beautifully remodeled home completed within a year's time. Now, after enjoying our home for over 10 years, we remain grateful to Rob for the timeless quality design and choices made in our remodel, so that the value and enjoyment of the space lives on." "As president of Temple Emek Shalom from 1999 through 2003, I viewed firsthand the work of Robert Saladoff as he led a volunteer committee charged with the responsibility of working with our architects to design a new synagogue building. Rob guided the committee members through a series of complex recommendations and decisions that helped to inform the architect of our needs and desires. It was Rob’s expertise, his collaborative work ethic, and, most of all, his adventurous but realistic contributions that helped make our new building the outstanding home it remains today."